Don’t worry your dance teacher does not hate you. Actually we look forward to seeing you more. You make our day. Here is a guide to help get the most out our dance classes. We only care about making you the best dancers you can be. You recently attended a wedding and the bride and groom had to many dance steps and looked stressed out during their first dance. It may be possible you’ve been watching some YouTube dance videos or shows like “Dancing With The Stars,” or “So You Think You Can Dance.” The definition of choreography is to compose a sequence of steps. If you don’t have a plan when you take your bride on the dance floor, then its possible that you should sway back and forth. If you don’t want your wedding dance full of choreography then just stick with 2 to 3 steps and make it simple. Of course we will help you. Anytime your spend together learning how to move in sync will make you feel better on your wedding day, but come in with realistic expectations. Learning how to dance takes time and dedication. We have clients that just want a bunch of steps. We call them step collectors. Unfortunately their quality of dancing suffers greatly because they evaluate their success based on quantity of steps instead of quality. We will kindly offer up the next move when we see that you are equipped with the right tools and skills to execute the next step. Trust your teacher and the order in which you are learning each step. There is a method behind teaching you how to dance. We will never refuse to service our clients, but please trust they know best. We only want to make the most out of your time and we pace our curriculum based on the time we have booked together. Your dance teacher just want to make sure you walk out of the dance studio with a finished product and a great experience. We feel your energy when you walk in the dance studio and being late causes stress and anxiety. Ok no problem at all but show us that on your first day not your last dance lesson. As long as its safe, both feet are on the ground, and your willing to compromise with modifications, anything is possible for your first dance. Anything is possible but you should plan on being in the dance studio multiple times a week. Schedule an introductory dance lesson first so your professional dance teacher or instructor can see what kind of plan should be put together for your first dance. Now now be patient with your partner and give them a chance to learn. Normally both partners are trying to lead during the dance and this is why we tend to bump into one another and fumble through our dance steps in the beginning. Your dance teacher will guide you through the process but we need to start with steps first and then work our way up. It’s not in the students best interest to be put in a room without outside distractions. There will movement and noise at your wedding and you must learn to dance in an active environment. As much as your dance teacher would love to give you the entire place to yourself, it’s just not economically feasible unless the owner of the dance studio wins the lottery. Every student at Windy City Wedding Dance in Chicago walks out of the dance studio with skills they can use for their first dance. We offer advice and dance instruction that can be used during your first dance. Some couples dedicate more time than others, but we love anytime we get with our students and do our best to rock your first dance. 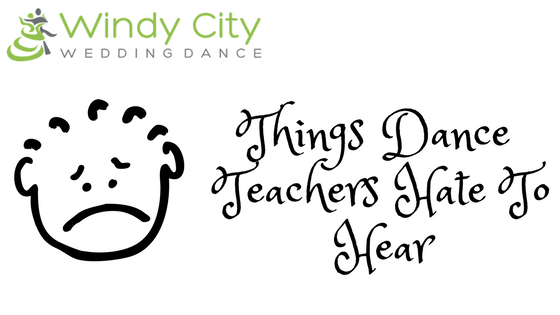 At Windy City Wedding Dance our professional dance teachers are full of patience, acceptance, and love. We are open 7 days a week and accommodate clients from River North, South Loop, West Loop, Downtown Chicago, River West, Buck Town, Wicker Park, Lincoln Park, Streeterville, Lakeshore East, and Lakeview. Our dance teachers are knowledgable and teach a variety of dance styles like Ballroom, Salsa, Bachata, Chicago Stepping and more. Looking to send someone a wedding gift. We offer the gift of dance. Check out these gift certificates on our home page.